In this age of mobility, it is not only difficult but also impossible to live without our smartphones. The reason behind this dependability is the mobile apps that have made human life so simple. These apps are changing the very way we live our everyday lives. And in order to get things done, we need lots of mobile applications. This has resulted in pressuring mobile app development companies to build more useful enterprise mobile applications. According to research conducted by Gartner, it was said that by the end of 2017, the market demand for enterprise application development shall outpace the need for the organizations to develop the apps. Also, the sale of mobile phones is expected to surpass 2.1 billion units in the year 2019. The numbers are huge and will keep getting bigger and bigger. This only shows how beneficial having a mobile app for business will be in the future. There are numerous advantages of mobile apps for industries, be it small or large. 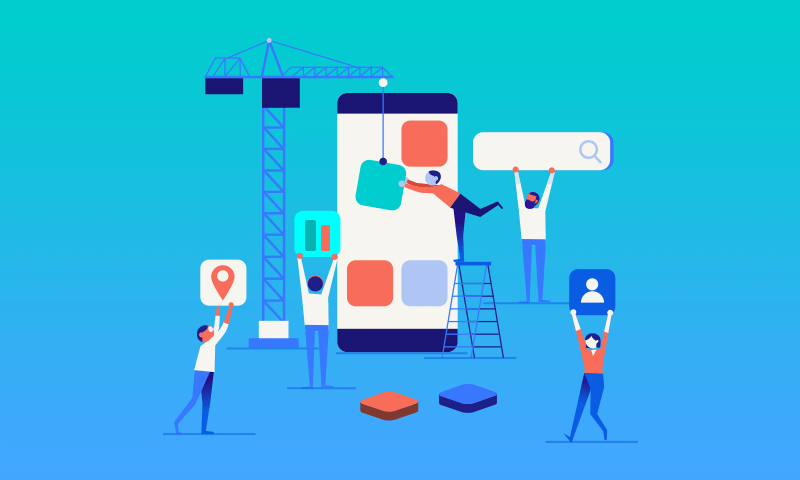 These app development services are utilized for the promotion of services that an industry provides, therefore, the app must have an innovative approach for targeting potential customers at the earliest. Increased revenue, the growth of industry and brand awareness are some advantages of having a mobile app. The healthcare industry has been using mobile apps for a long time now and the impact of apps on the healthcare industry is huge. Apart from quick checkups and storing patient information in one tap of the screen, there are many other ways apps are benefiting this industry. Virtual assistance of doctors, identifying the disease through images and much more has been made possible because of mobile apps. The travel industry is using apps to get more customers and also using it to provide better services to them. The travel apps are revolutionising the travel industry by giving special services to customers, allowing apps to check in and check out without ease, getting combined bookings done and much more. All this is changing the face of travelling and apps are becoming the best travel companies for travellers. Restaurants are one of the most successful industries of all times and with the help of mobile apps, they have been able to excel at their services. Restaurants need well executed mobile apps to allow customers to reserve seats, place orders, find good places to eat and anything else that enhances user satisfaction. The apps are even used to showcase restaurants based on the review given by previous customers. And the biggest benefit of mobile apps for restaurant industry is that they gathering a massive audience through apps which increases the profits. The entertainment industry is no longer limited to a TV screen but has rapidly shifted to mobile phones and tabs. The reason for this rapid shift is an increase in mobile users. Mobile apps let viewers view any type of show, at any time of the day and at any place. From live streaming to news updates, everything is available on apps. They say mobile is the new TV and it has become possible only through apps. All these examples show the benefits of mobile apps for business. However, these are not the only industries that benefited from their mobile apps. There are others such as social network, e-scooter, etc. that have gone mobile and are seeing an immediate increase in their business revenue. Some restaurant businesses like DoorDash have a business model that’s completely based on mobile apps. Why Does Your Business Needs a Mobile App? With the increase in mobile app usage, industries are taking the benefits of mobile app application development to increase their customer base. Interaction with users becomes easier with the help of mobile apps. Audience building is one of the most important benefits of mobile apps for small businesses in the industry. Since they are just starting, gathering customers through a mobile app is a great strategy. Mobile apps are a one-stop point for getting all the relevant information related to the brand as well as showcasing the products and the services. Newer products and services are showcased on the apps and promoted via ads. This will increase the sales of the product while keeping the promotion cost lower. 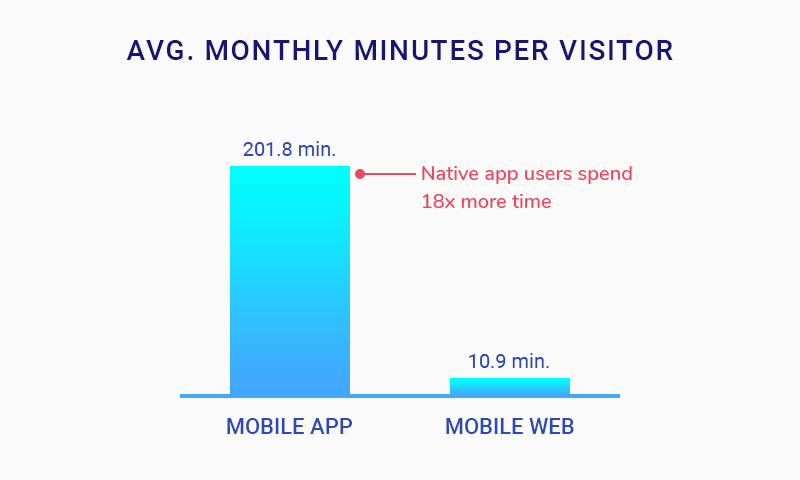 With the help of mobile apps, businesses can track important analytics such as the number of visitors, users most viewed product, time spent on each section of the app, and a lot more. Analytics are crucial for marketing and advertising as it makes sure that the targeted audience is right. There are still many companies within an industry that don’t use their mobile app’s full potential and there are some companies that don’t even have a mobile app yet. This certainly plays the benefit card for businesses that are working hard with their mobile apps for business. Although the competition is still quite low in this area yet it is a big advantage. Mobile apps for small businesses can be a godsend keeping in mind the fact that using apps as a tool for growth is extremely cheap. Most businesses are sceptical because they don’t know how much does it cost to make an app and eventually assume it costs a lot. However, that’s not the case. Once it is developed, a mobile app for business is the best tool for growth. Industries like eCommerce, travel, etc. often require online payment for their products and services. Secure payments are one of the reasons why your business needs a mobile app. Apps can be developed with secure payment options gaining the trust of customers who find it hard to trust websites for making payment. Secure payment option is the most profitable benefits of mobile apps for small businesses. The industries are usually focused on exploration of newer avenues in the marketplace for the implementation of mobile application development strategies for their campaigns. With the increasing number of mobile users, there must be an increase in sales while satisfying the user requirements. The mobile apps are very effective in ensuring progress levels within a short span of time. Another useful advantage of mobile apps for business is that it offers a hassle-free experience on the customer support request. Businesses can retain their customers with the help of attractive offers such as discount coupons, vouchers, etc. Uber’s business model allows it to offer discounts to the mobile app users and so far has been proved to be the best strategy. Powerful messages are delivered to the customers at the best possible rate so that the business organization saves money. These messages are effectively delivered for the conversion of the visitors into potential customers. An irresistible offer, when notified with the push notifications message of the mobile app, is an effective way for business promotion. Mobile apps are supremely beneficial in fulfilling user expectations. Customers are usually happy when they discover an app that is easy to connect and offers customers the necessary tools for an easy use of the apps. 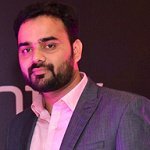 How to Get Started with Getting Your Mobile App Developed? The desire to get a mobile app developed becomes easier if employing an app designing company. The mobile app development companies will first and foremost try to evaluate the business requirements of the clients while working closely with them. This is done to understand what the client is looking for in the app, in the best way possible. Apart from proper functioning, the mobile apps that are developed must also have an attractive look. Multiple programs can be integrated easily with the affordable rates offered by the app developed services. Before developing an app, one must be absolutely clear on the purpose that it has to serve. However, most of the time the cost of the app becomes an issue. Majority of small businesses are unable to find how much does it cost to make an app and that prevents them from getting mobile apps for small business. It is a common practice to find an app development company near to the location of the business to have a proper meeting. Other avenues to find and hire best app developers are through the internet, meeting their essential needs, for striking a perfect match for their business. If you are willing to get a mobile app developed for your business then contact us at Appinventiv. We have an exceptional team of mobile app developers that build apps for clients to increase their revenue as well as business reach.